You’ve heard it said – we can control ourselves but we can’t control others. So true! We may not like or approve of what someone else is doing, but all we really can change or control is our own response to what’s happening. To the side is a picture of the “spheres of control.” When you’re faced with a conflict, consider where you “sit” in the spheres – do you have control? What do you have control of? 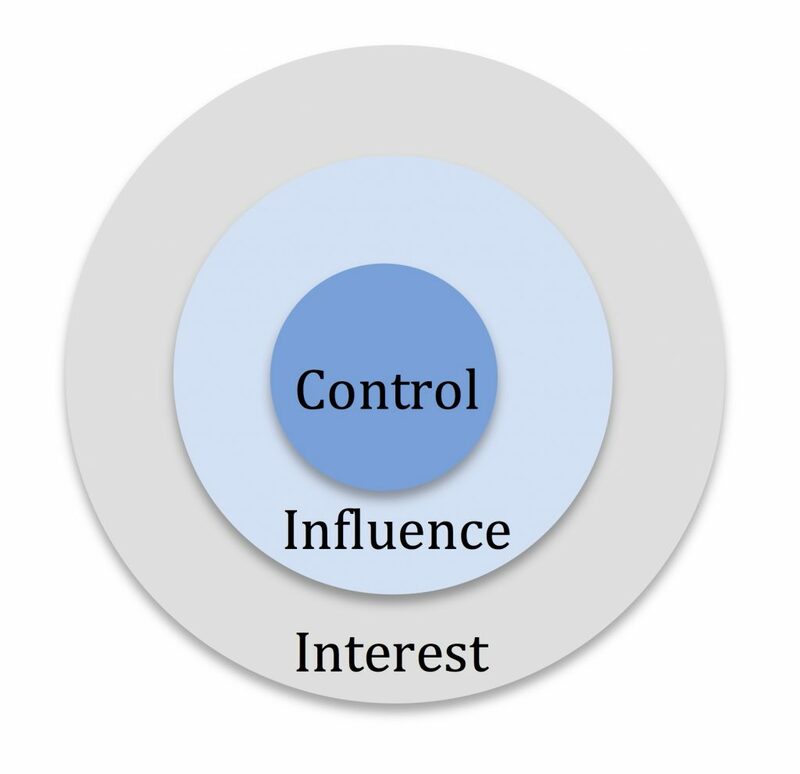 If you don’t have control, do you have influence? If you don’t have any influence, do you have any interest in the outcome? By identifying where we sit, we can better manage our responses to conflict with others. Trying to control when we really only have influence will lead to hurt and damaged relationships every time. But what should you do if you really don’t like what someone else is doing or the choices they’re making? The answer is: Consequences. Consequences speak louder than words. They need to fit the negative behavior (i.e. be logical or a natural response), be timely and be clear. Picture the story of Mary, who is upset that her mother-in-law continues to give her granddaughter candy and soda when she watches the child, even after several requests by Mary to offer the little girl healthier choices. Mary can’t control what her mother-in-law chooses to do in that situation. She’s tried influencing her by making her request for a different behavior – but that didn’t work. The consequence can be that she finds a different babysitter for her child. Understanding where you’re positioned – in control, influence, or interest – will help you determine the most effective response to a difficult situation and support healthy relationships with others.